Many hospital administrators worry that they can’t afford to implement these precautions. The truth is, they can’t afford not to. 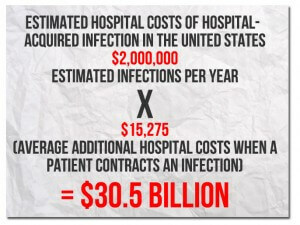 Infections erode hospital profits, because rarely are hospitals paid fully for the added weeks or months of care when a patient gets an infection. For example, Allegheny GeneralHospital in Pittsburgh would have made a profit treating a 37-year-old video programmer and father of four who was admitted with acute pancreatitis, but the economics changed when the patient developed an MRSA bloodstream infection. He had to stay in the hospital 86 days, and the hospital lost $41,813, according to research by Richard Shannon, former chairman of the Department of Medicine at Allegheny. Similarly, a woman came into the hospital for stomach-reduction surgery, a procedure that should have produced a $5,900 gross profit for the hospital. But when she developed a central line-associated bloodstream infection and had to spend 47 days in the hospital, that profit turned into a $16,000 loss.